Generate new insights with unique datasets that help you go from data to decision faster. 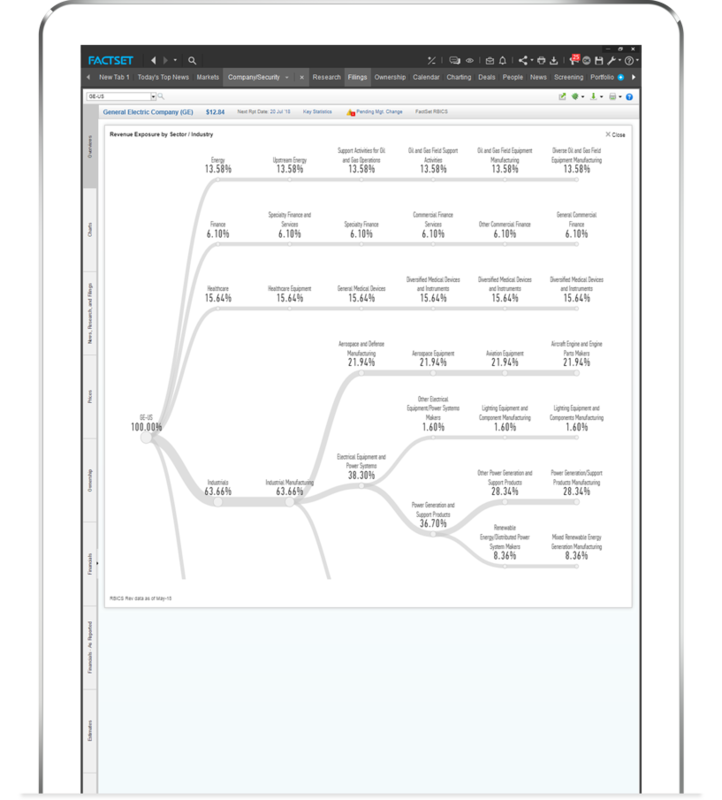 Find untapped alpha with unique datasets backed by best-in-class symbology and data concordance. Gain a competitive advantage and find new insight with FactSet alternative data: one-of-a-kind insight generated by novel data and analysis techniques. With this data, you can reveal interconnecting business relationships, business performance and market indicators, sources of risk, and areas offering new investment opportunities. For even more alternative data, visit our Open:FactSet Marketplace. A comprehensive database that classifies companies into thousands of specialty sectors based on the products and services they sell. See over 9,000 companies’ primary and ancillary lines of business and group companies with up to three times the depth found in conventional industry classification systems. When fully expanded, this offers over 7,000 sector and product groups, providing the precision necessary to understand companies in a multi-dimensional manner. Uncover direct and indirect relationships and hierarchies between entities, securities, people, and funds. 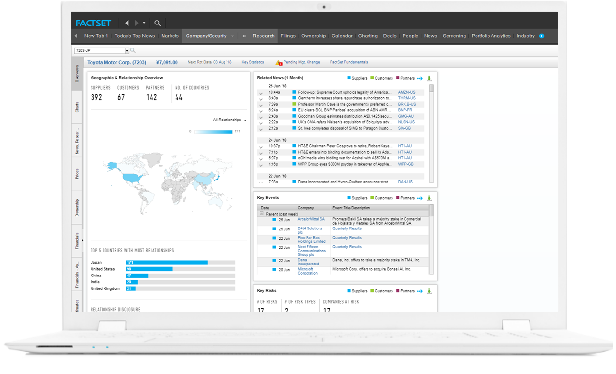 Using an entity-centric data model, Data Management Solutions provide access to our complete security and entity level symbology, comprehensive entity reference data, and the necessary relationships and connections you need to create a foundation that connects disparate sources of information to a master identifier. Research, ratings, and analysis of the environmental, social, and governance-related business practices of thousands of companies worldwide. 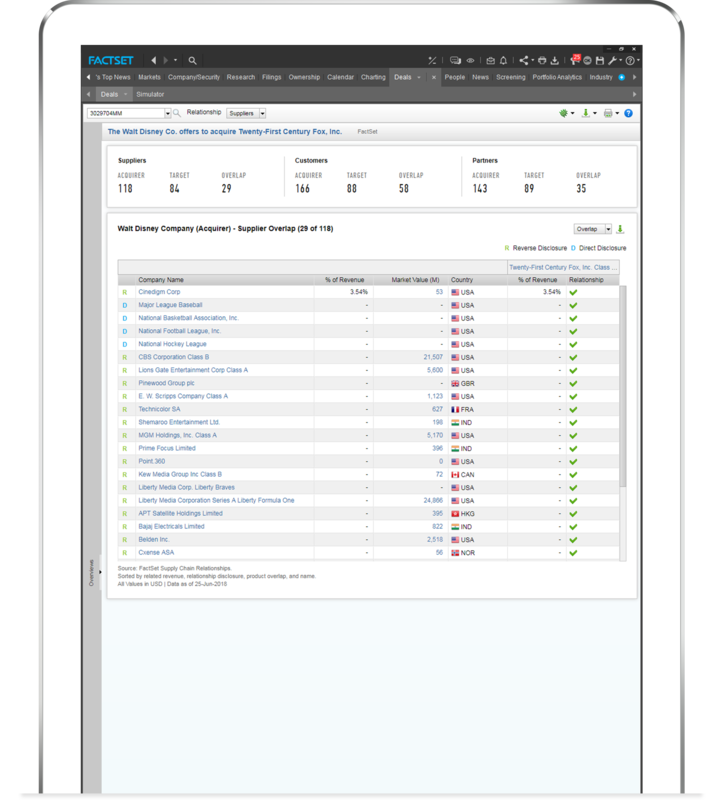 FactSet integrates a mix of in-house data and third-party environmental, social, and governance research and ratings from some of the premier names in the space, including MSCI, Sustainalytics, Truvalue, and RepRisk. FactSet data includes information on corporate activism and governance, geographical revenue, supply chain, and global sanctions. Together with our strategic partnership providers, FactSet understands which ESG factors affect a company and how prepared it is to manage risks. Identify opportunities and risks with companies' revenues by geography. Geographic Revenue Exposure data provides a highly structured and normalized display of companies’ revenues by geography. Quickly understand a company’s revenue exposure in countries affected by geopolitical, macroeconomic, and market risk. View the geographic footprint of a company based on sources of revenue, versus country of domicile, and leverage a consistent, accurate, and flexible dataset to analyze global revenue exposures at the company, index, or portfolio level. Monitor the entities and individuals who appear on global sanctions lists. 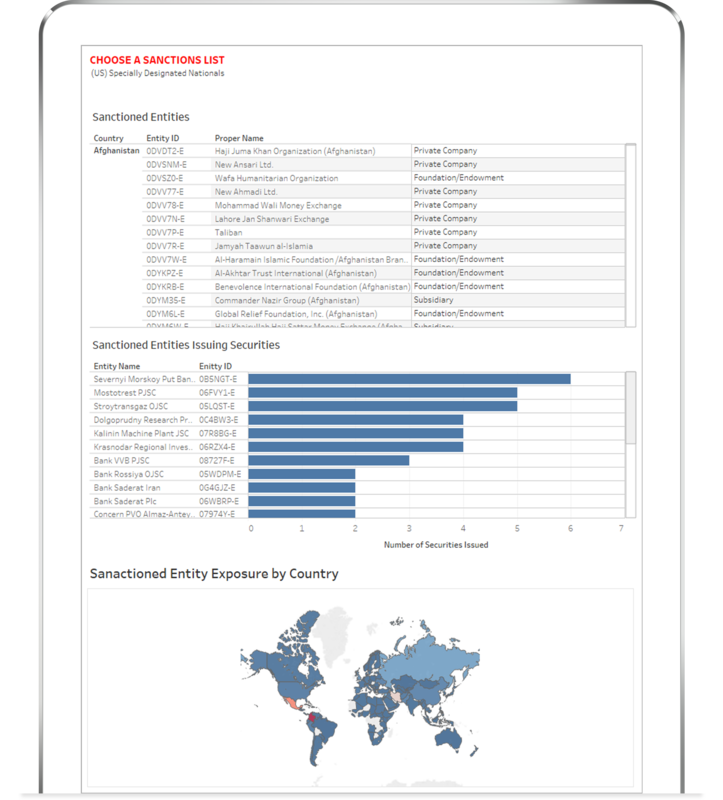 Monitor the entities and individuals on U.S. and global economic sanctions lists with FactSet Sanctions. This dataset monitors the U.S. Department of the Treasury’s Office of Foreign Assets Control (OFAC) sanctions lists and over 70 other restricted lists maintained by global authorities, including Great Britain, the United Nations, and the European Union. The entities and individuals that appear on these lists are mapped to FactSet’s symbology and further analysis is conducted to identify related entities and individuals, as well as the connecting relationship. Track maritime shipping transactions from 200 U.S. ports and 1,000 non-U.S. ports. Track maritime shipping transactions from bills of lading of 200 U.S. ports and 1,000 non-U.S. ports with supply chain shipping transactions data. Information includes cargo content descriptions, departure and arrival ports, and shipper/consignee relationships, associated with maritime freight traffic subject to tracking or taxation by the U.S. Customs and Border Patrol. 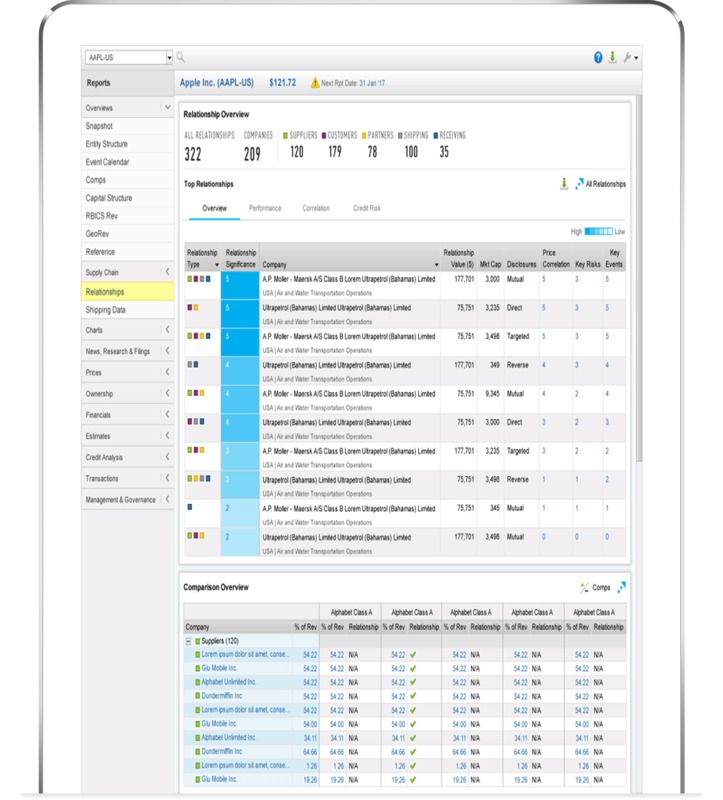 Using a combination of FactSet’s automated mapping processes and manual oversight, the transaction data is linked to FactSet’s extensive entity database to identify shippers, consignees, ports, and carriers. Access the complex networks of companies' key customers, suppliers, competitors, and strategic partners through supply chain relationships data. Identifying the nature of a company’s business relationships is crucial to understanding its business opportunities, correlations, and risk exposure. 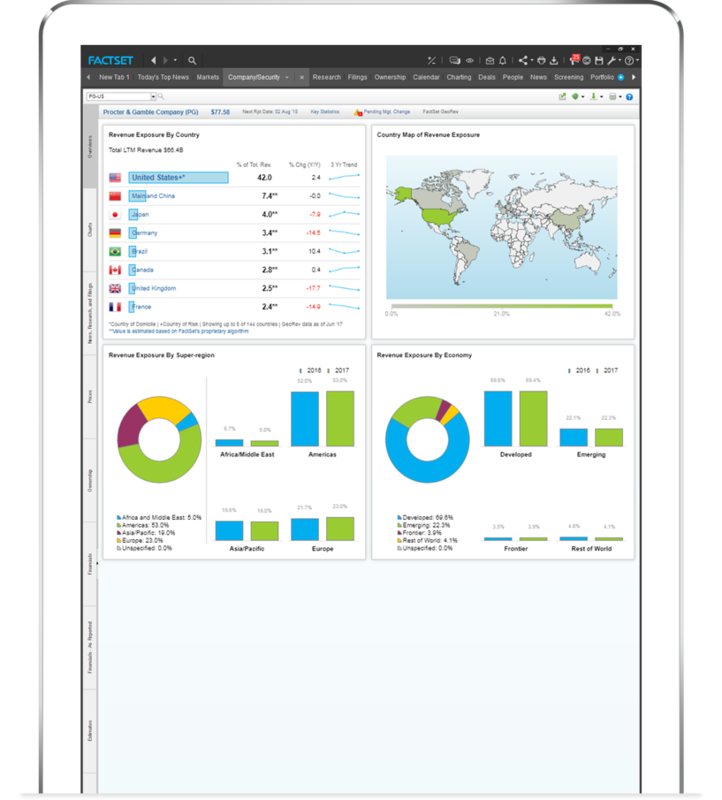 FactSet supply chain relationship data is built to expose business relationship interconnections among companies globally. With FactSet supply chain relationship data, you can identify materially related companies and categorize their relationship dependencies. With 13 key company relationship types such as customers, suppliers, competitors, and strategic partners, you can determine the revenue value of a business relationship between two companies, understand how extreme market environments could affect your custom portfolios, and uncover interconnected relationships within and around a stock portfolio that may affect overall performance. 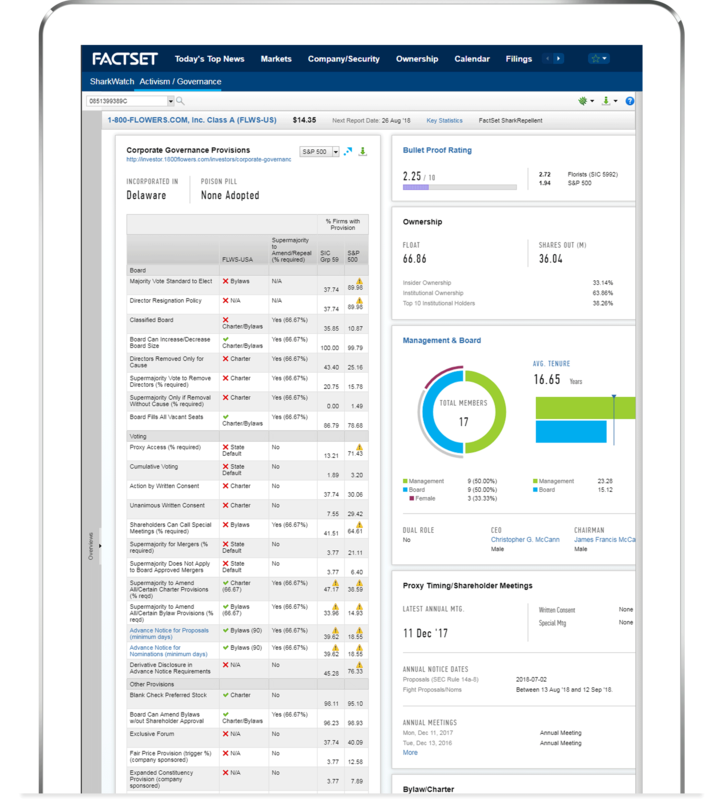 Spend less time managing data and more time analyzing it when you offload the burden of screening data sources, scrubbing raw data, and connecting third-party content to FactSet. Financial datasets keep growing, but their value is lost without complex evaluation and integration. 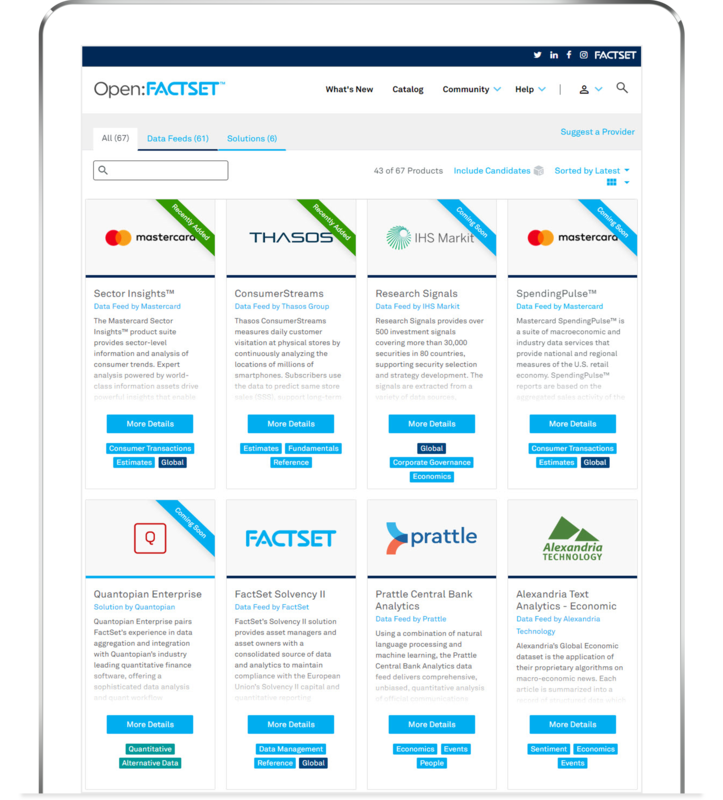 Leverage FactSet’s deep expertise in data integrity and unlock the power of data with the Open:FactSet Marketplace. Combine pre-linked, harmonized datasets, from ESG to satellite, with FactSet’s leading data feeds, such as ownership, supply chain, and fundamentals. 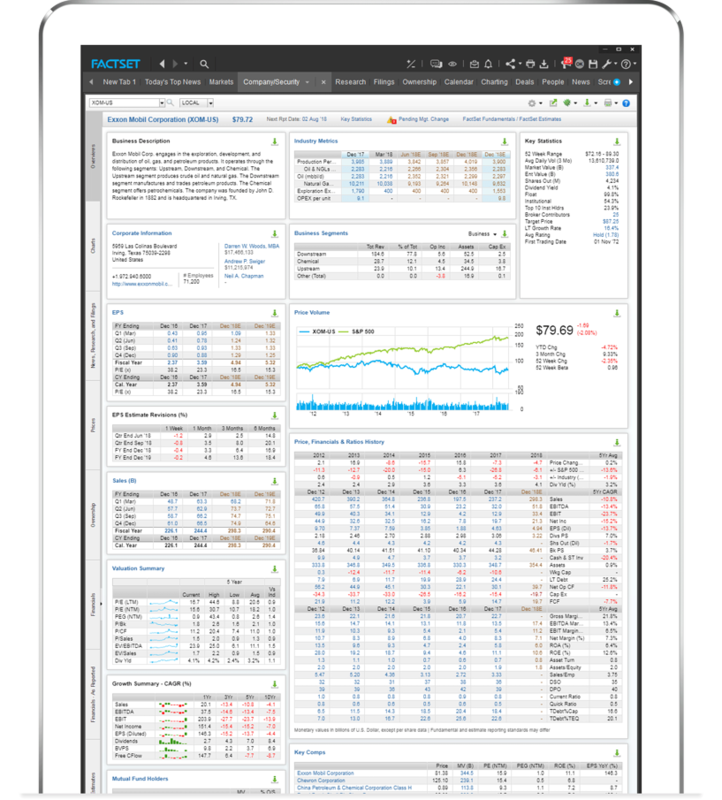 Seamlessly link data feeds from the Open:FactSet Marketplace to your models and systems without the need for custom code, enabling your team to generate greater alpha.